Acorn starts out promisingly, with a witty monologue delivered by a knackered junior doctor working in palliative care. Her superiors want to work on her bedside manner but she prides herself on keeping a professional distance and making her patients as physically comfortable as possible – getting emotionally involved would only complicate matters. Performed with astringency and precision by Deli Segal, this Persephone doesn’t have any queenly power, possibly suggesting that the NHS is the Underworld? 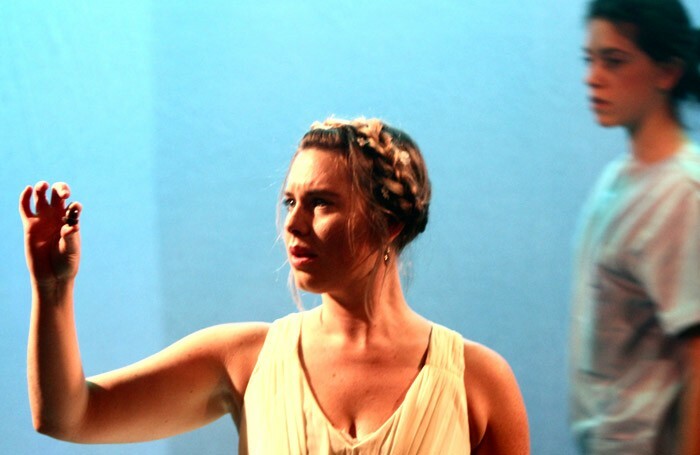 Bride-to-be Eurydice’s parallels to her mythic counterpart are less opaque but she’s an irritatingly fey creation, albeit performed with full-on gushing mental instability by Lucy Pickles. Performed against a gauzy set with direction by Tatty Hennessy that relies too heavily on technical effects, Acorn is too underdeveloped to fully ripen the themes it sets out to explore. The incomprehensible male voiceovers and flashing montages of film clips are faintly flummoxing, and the frequent use of the f-word is a lazy way of conveying anger and frustration. Dromgoole does have an ear for the humorous mundanities of everyday life – more of that and less whimsy would make for a far more fruitful and coherent piece of work.